This cheerful snowy fellow shares a woodland feast with his friends. A wondrous winter jigsaw by artist Kathy Goff. This puzzle contains 300 large piece and measures 45 cm x 61 cm. Available in two-piece counts. 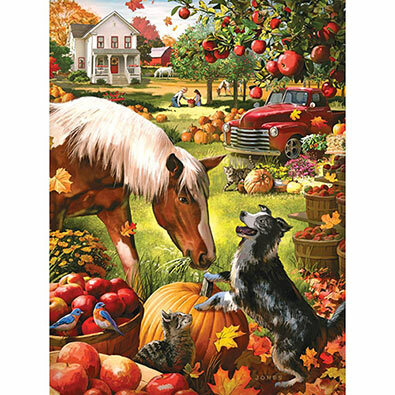 This 300 large piece jigsaw is designed by Sandy Rusinko and measures 45 cm x 61 cm. This puzzle depicts a cluttered antique shop and two girls hoping to find something nice within it. Available in two-piece counts. This 300 large piece jigsaw puzzle is designed by Jack Williams and measures 46 cm x 61 cm. Baby animals play amongst the flowers in a farm. Available in two-piece counts. Stepping Stones is a 300 piece jigsaw puzzle designed by artist John Sloane. A young girl contemplates crossing the stream on randomly placed stones. Fall has arrived with the changing colours of the leaves in the trees. Available in two-piece counts.